Lately I’ve been drinking a lot of carbonated water at work and at home. My favorite way to drink it is with quite a few dashes of bitters. While I like the flavor of aromatic bitters (and I’ve been using a previous batch frequently), I prefer fruit bitters. Having barreled through a couple bottles of Fee Brothers bitters I decided to try making my own orange bitters. Here is the recipe from my first batch. Okay, so that was batch 1 which netted about 20 oz of really tasty orange bitters. They were lightly sweet, with a really fresh orange flavor. The spices were there but not overpowering. They lasted all of about 2 months. Sooo…wanting a little more output and some additional flavors, I moved on to batch 2. This batch netted about 3.5 cups (30 oz) but the flavor isn’t as robust. The orange flavor is more subtle (and the color is notably lighter). The bitter notes are a bit more pronounced, likely from the extra pith. Finally the spice qualities are about the same. Going to be good for water flavoring, but not as powerful as I was hoping. So, for batch 3, I’ll definitely be going back to something closer to batch 1. I think the extra zest (versus whole peel) gives more orange punch and the lower quantity of liquid made the end product more concentrated. Go figure, right? Though, I’m liking the additional spices. Likely my next batch will retain the allspice and possibly add ginger or cardamom to the mix. Having come up seriously lacking in my search for commercial falernum I turned to my circle of cocktail enthusiasts and found a number of great recipes. In looking at a few I decided on Rick’s recipe. But why, you ask, did I choose the Kaiser’s recipe over the others. Well, first it’s dirt simple. I like simple. Especially when I’m taking a first stab at something like this. Since the ingredient list is short I’ll be able to discern what I like and dislike about the recipe and tweak it to meet my palate. Second, I liked Rick’s comments on the use of fresh juice in falernum. Since I’m not likely to use it all over the next week I wouldn’t want it to get funky as the juice goes south. Finally, as Doug echoed Rick has this nicest looking falernum in process. You’ll note this post doesn’t include any pictures of my own. Well, that’s cause it’s not a gorgeous ingredient, but it is damn tasty. Now for a recipe. Now, I have to admit that for mine I didn’t toast the spices. Not because I don’t think it’s a good plan, I simply noticed that I was supposed to toast them once they were already submerged in overproof rum. Seemed like a bad time to introduce heat. Next time I’ll definitely be toasting them. So, what’s the verdict on this recipe? I like it, but I don’t have a lot to compare it to at this point. It’s spicy and tastes very tropical. I’m definitely going to have to mix up some Tiki drinks to make full use of this new ingredient. Once I’ve played around with some other drinks I’ll be ready to construct my own recipe. If you’re interested in other recipes here are links to a few that I found in my poking around. Today I ended the steeping of my bottle of Tequila por Mi Amante. What began a slightly sharp agave elixir is now, well, it’s now something completely different. It’s now a crystal clear ruby hued nectar. The aroma is what gets you first. 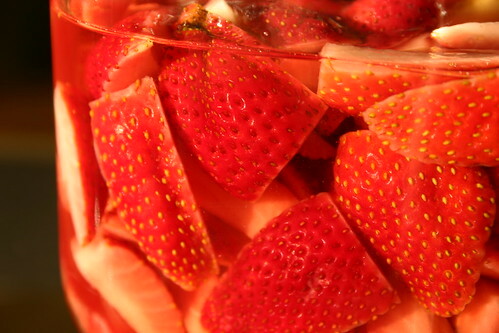 It’s got the tequila scents that you would expect, but layered on top of those is the aroma of fresh strawberries. If you’re not under its spell by that point the flavor will push you over the edge. The sharpness of the tequila is replaced with a subtle strawberry fruitiness with just a hint of sweetness. I’ve only had time to sample it straight up and let this be a word of warning. If you decide to try a few sips right after bottling you may never close the bottle again. In fact, I’d go so far as to say that you may have some unpleasant encounters with the floor were you to go this route. We’re all adults here. So, by all means, sample at your own risk. After that first sip my head soon started filling with possibilities for how to make use of this wonderfulness. I’m thinking a Margarita, of course, maybe a Paloma as Paul Clarke did, maybe even a riff on the Daiquiri with agave syrup and lime. The softened tequila sharpness really makes this a much more versatile ingredient than straight tequila in my mind. Some thoughts for my next batch or your first. One, use a full 750 of tequila, no reason to leave a little behind. Two, slice enough strawberries to where the tequila barely covers them all. This will give you maximum strawberry flavor. Three, when it comes time to strain use a metal strainer with a layer of paper towel inside. The paper towel will catch all the tiny hairs that come off the strawberries during infusion. Also, this will allow you to give the strawberries a squeeze to extract all the goodness. Four, and this one won’t be hard I promise, drink it relatively quickly. 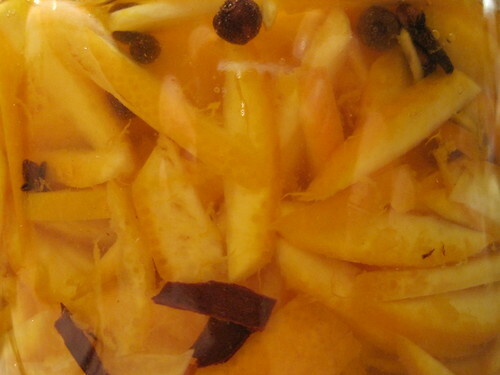 As with all infusions the flavors will begin to fade over time. I’d say you have at least 4-6 months though. Finally, some recipes out there suggest adding sugar. Please don’t. This will only prove to limit your cocktail options and should you want it sweetened to serve as a liqueur you can always add a bit of simple syrup later. Well, that’s about all I have for today. As I get a chance to mix up some cocktails I’ll post updates. But don’t wait until then to get your own batch started. With summer nearly in full swing the berries will be sweet and cheap. A perfect time to put up a bottle to steep. While traversing the interwebs looking for recipes for this week’s cocktail, the Paloma, I came across this bit of deliciousness. Paul has taken strawberry infused tequila (Tequila por Mi Amante) and made what sounds like the best Paloma ever conceived by human kind. The recipe for this wonderful infusion comes from Charles Baker’s Gentleman’s Companion (also via Paul Clarke). After reading Paul’s post and looking at the pictures I desperately wanted, nay needed, to make some for myself. So, being a man of some means, I did just that. 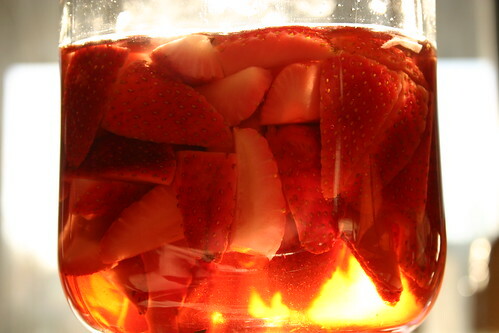 I combined about 600 ml (total WAG) of Hornitos Reposado (what I had handy) with about 3 cups of sliced strawberries and stashed it in the fridge. The infusion will need to steep for about three weeks so sadly I won’t be able to enjoy a Paloma with the elixir until then. Stay tuned for the no doubt wonderful results. As I mentioned in my MxMo post on the Fire Island Daiquiri I’ve been steeping a new batch of Hellfire Bitters for the past couple weeks. The recipe I used is the same that I used for my first batch, but I changed it up a bit. 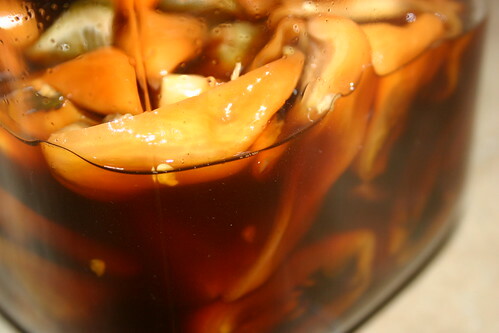 When I made these bitters the first time I used Thai chiles and the resulting bitters were warm, but not scalding hot. For the Fire Island Daiquiri I used about 4-5 dashes to achieve the level of heat I was after. The resulting bitters are hot. Seriously, seriously hot. For my first cocktail with them I mixed up a Fire Island Daiquiri and added a single dash of the bitters. The heat level was perfect. So now I have two chile bitters to work with. One that will add very subtle heat and can be used for those who don’t like spiciness as much and another batch that can be used to add true fire to a cocktail when needed. Seeing as these bitters are so much hotter than their predecessor I felt a name change was required. As I mentioned these bitters are crazy hot, like surface of the sun hot. Or, more geekily, as hot as the Sun’s corona. Which, for those of you playing along at home runs between 1,000,000 to 3,000,000 degrees Kelvin. 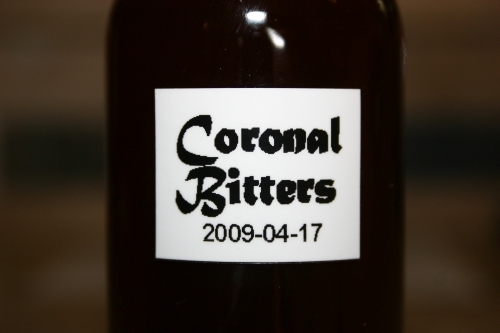 If you haven’t tried making your own bitters yet it’s worth doing. It really is simpler than it seems on the surface and the results are surprisingly good.